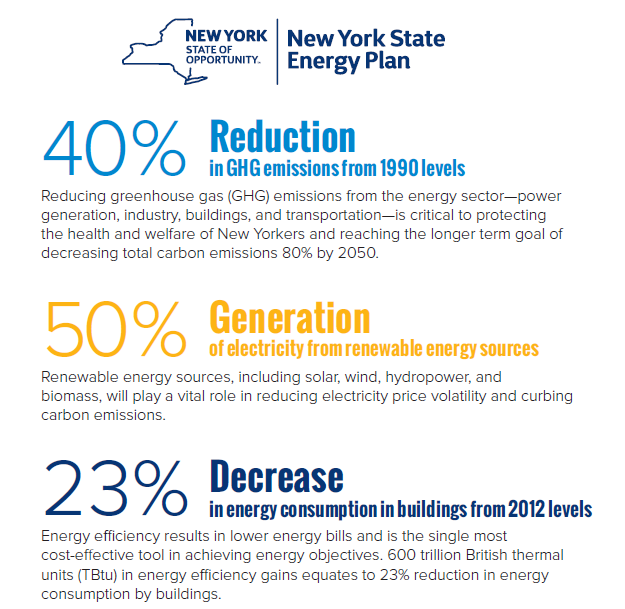 Last week, the Cuomo administration finalized the State Energy Plan, which establishes specific clean energy goals and a framework on how New York’s energy is to be produced, distributed and consumed. The plan calls for cutting greenhouse gas emissions 40 percent by 2030 from 1990 levels; lowering energy consumption in buildings 23 percent from 2012 levels, and generating half of the state’s electricity from solar, wind, hydropower and biomass by 2030. The idea is to gravitate toward "a clean, modern economy." Ahead of the Energy Plan Release, more than 100 elected officials from around the state urged Governor Cuomo to set what they call a "Nation-Leading Renewable Energy Standard." Speaking on behalf of the group, city of Gloversville 5th ward supervisor Gregory Young says the 50 percent benchmark is doable. "The science is really becoming quite clear into the effects of fossil fuel extraction and consumption, and so renewable energy development is important to make our state more resilient in the face of climate change and these challenges. For us, committing to the target of 50 percent of electricity from renewables, really, it's bold, but New York has always been a leader across the country, and so we feel that this is very achievable." Another report, issued by the non-profit Clean Energy States Alliance just prior to the release of the State Energy Plan, looks at how individual states are supporting clean energy and offers suggestions on how to further encourage growth. CESA's executive director, Warren Leon, says progress on clean energy has really rested on a "three-legged stool." "...with each leg being equally important. And the three legs are the states, the federal government, and the private sector. There's some risk that the federal government will be pulling back. There are some federal tax credits that have either expired or are about to expire. And if the federal government doesn't continue to pull its share it’s going to make it harder for the states to make progress, because the states will be bearing a higher percentage of the economic burden of moving clean energy forward." Environmental Advocates of New York says the Cuomo team deserves credit for its aggressive State Energy Plan, but cautions the goals may be just out of reach should the state go the way of re-firing outdated fossil fuel plants and raiding carbon abatement programs like the Regional Greenhouse Gas Initiative. Again, Gregory Young: "I think for this to be successful we really need a partnership with incumbent energy providers and the Public Service Commission to really work together. It's an ambitious goal for the state, but it's very achievable." New York is drawing more and more power from wind and solar, but its renewable energy standard is set to expire at the end of the year.